Let me start by saying that everything we do in life and at work starts with the basics. If we don’t get the basics of human interaction right, we don’t even have to bother with big ambitions such as better health & safety, better quality, more clients, bigger buildings, more money, and “more and more of everything”. Lacking the basics means that you may risk your reputation as a person and as a company. 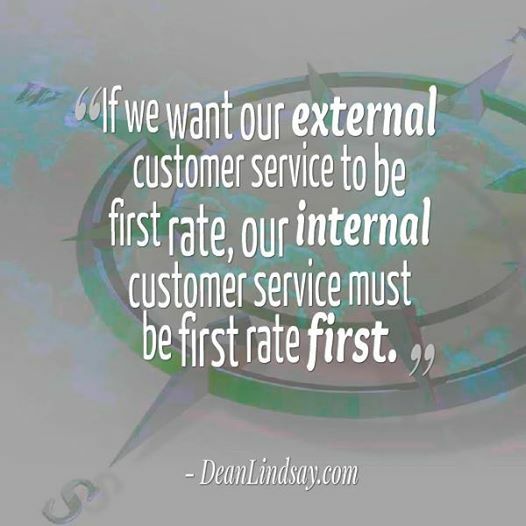 The concept of internal customer service seems to be foreign to way too many people in our organizations. So what does internal customer service mean? Internal Customer Service refers to the interactions between all the employees who support the company and the people in various departments. For example, the employees are the customers of HR. Machine operators are the customers of Maintenance. In short, every department has internal customers and they should be aware of their approach. Let me explain why I believe there is a lack of internal customer service. I think people don’t do this on purpose. They are either overwhelmed and overworked, or they simply don’t understand how things are connected and how their actions or lack of actions affect people around them. tunnel vision: The tendency to focus exclusively on a single or limited goal or point of view. They can’t see the big picture. silo mentality: A mindset that can be observed when certain departments do not wish to share information with others in the same company. Give tours of different departments: this is a great way for employees to increase their awareness and understanding how everything is connected. Bring people “together”: facilitate communication get-togethers in which people get encouraged to become curious about other people’s job, their challenges and their frustrations. Allow them to find solutions together. Mindfulness – become more aware how tasks are delegated and who has to handle the most. Observe people’s faces. Are they overwhelmed? Are they frustrated? Check in with them. Sometimes the people we trust and the ones who get the job done, get the most projects and that’s how they can easily burn out. On the other hand, the people who are slow, sloppy, unreliable and with a bad attitude get away with it because they are never being held accountable. My personal favourite: get people from different departments to engage in team sports (soccer, hockey, baseball, volleyball, basketball) together. The people who can play together, will be able to stay and work together. That’s how you build sustainable relationships. Remember, the worst behaviour that you see in your organization is there because it is accepted and nobody does anything about it.